This year marked the 13th anniversary of the brutal rampage that took the lives of two U.S. Capitol Police Officers: Detective John Gibson and Officer Jacob Chestnut. 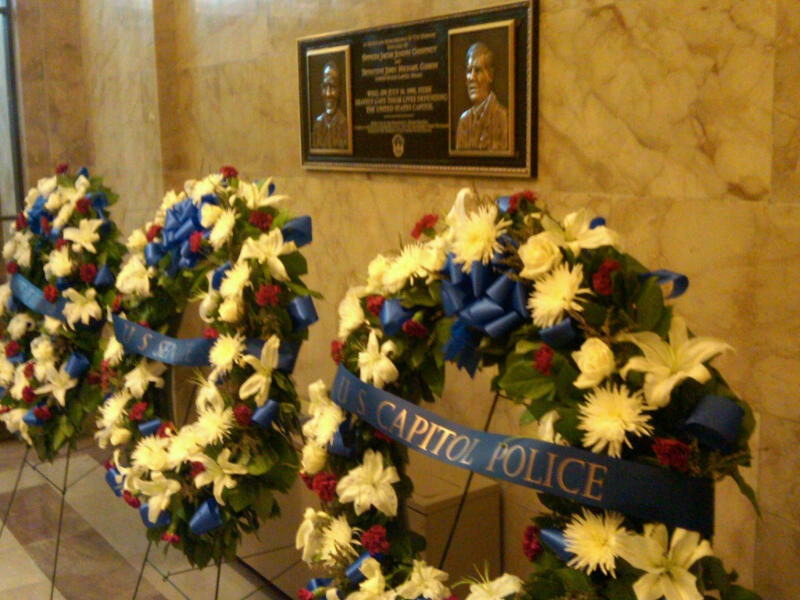 On July 24, 1998, Officer Chestnut and Detective Gibson were guarding the East entrance of the Capitol building. At approximately 3:40 pm, a gunman attempted to force himself past the officers. When Officer Chestnut denied him entry by obstructing his path, the deranged gunman fatally shot him at point-blank range. Detective Gibson warned those nearby to seek cover then chased the gunman down the hallway. They exchanged fire and one of the rounds hit Detective Gibson, who succumbed to his serious gunshot wounds. A plaque has been placed in the U.S. Capitol to pay tribute to their service and sacrifice, and their names are engraved on the National Law Enforcement Officers Memorial. On Monday, both U.S. Senate Republican Leader Mitch McConnell and Senate Majority Leader Harry Reid began their remarks on the floor of the U.S. Senate memorializing Detective Gibson and Officer Chestnut by laying a wreath and observing a moment of silence to pay tribute to the courageous officers. Both Detective Gibson and Officer Chestnut were 18-year law enforcement veterans. Their dedication to service and their commitment to safeguarding the U.S. Capitol and the citizens inside will never be forgotten. Citizens across America should take a moment out of their busy days to remember these two valiant individuals who made the ultimate sacrifice on July 24, 1998. Last week, Sgt. 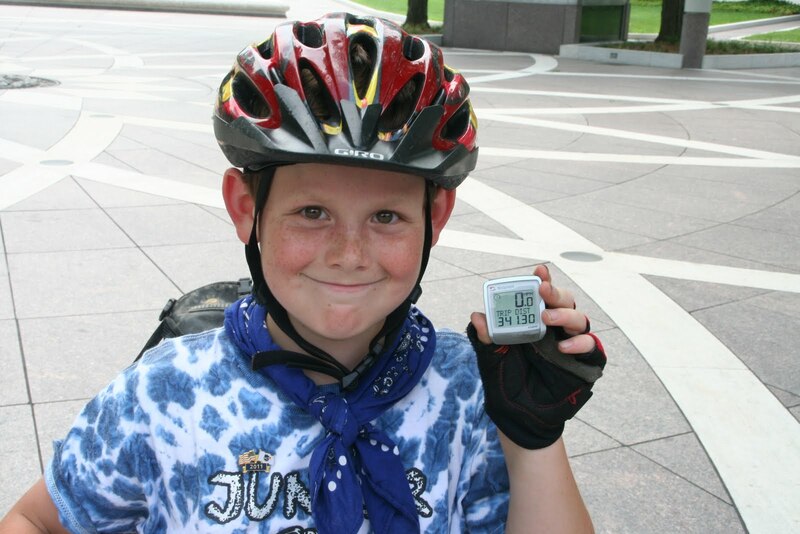 Doug Forrest and his nine-year old son, Avi, completed a 341 mile bike ride from McKeesport, PA to the National Law Enforcement Officers Memorial in Washington, DC. 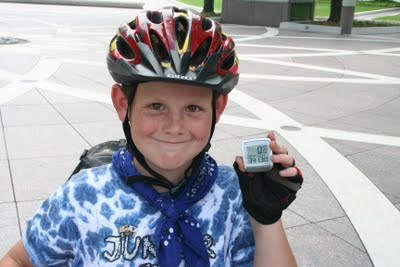 Avi made the journey to honor fallen Indianapolis Metropolitan Police Officer David Moore, killed on January 26, 2011 and to raise funds for the David S. Moore Foundation, established by Officer Moore's parents after his death. As Avi, Sgt. Forrest and Susan Schneider peddled into the Memorial, they were greeted by Officer Moore's uncle, Juan Moore. Officer Moore had previously visited the Memorial with his father, an active law enforcement officer also with the Indianapolis Metropolitan Police Department. According to a story by WISH TV, Sgt. Forrest stated that, "For me, the Memorial is always an emotional experience. I always break down and cry when I think of them because I miss them when I see their names on there. Avi just knows it's really emotional for his dad, and he pats me on the back and tells me, 'It's OK.'"
Congratulations, Avi on your incredible journey, and thank you for honoring the memory and service of Officer David Moore. The All American Soap Box Derby race was held in Souderton, Pennsylvania on June 4. The longstanding soap box car racing tradition began in 1941 and has continued to unite the community for about 70 years—people of all ages look forward to this exciting event each year. Local businesses often sponsor cars and offer their services and assistance free of charge in support of the special occasion that positively impacts the community. 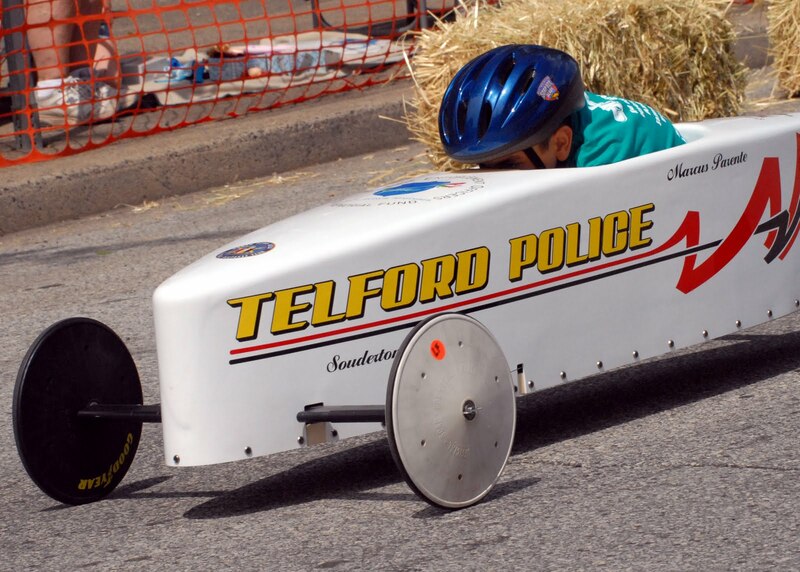 This community spirit and collective effort helped the Telford Borough Police Department and a local fifth grade Franconia Elementary School student named Marcus participate in this year’s race. It took several hands working together to discover the cost of a pre-owned soap box car, acquire and prepare a car, find a driver, and raise awareness and funds for a worthy cause. Back in September 2010, Sgt. Jim Minninger and members of the Telford Borough P.D. requested funding for the car cost and race fees, but budgetary cuts left their request denied. This minor setback was reconciled by a local business owner who donated a soap box car kit and arranged for another local business responsible for designing and applying the graphics to patrol vehicles to donate decals and striping for their soap box car. With the generosity and support of the community, the soap box car was covered. Now they needed a driver. The Department decided to offer the opportunity to a local child that would not otherwise be able to pilot a soap box car by holding an essay contest. They were granted permission from the local school district to distribute fliers to third through fifth grade students announcing the search for a soap box car driver and advertising the essay question: “How would you ‘Do Your Best’ if chosen to pilot a soap box car?” The winner was eleven-year-old Marcus, whose winning essay said: “I will always follow the directions, give my best effort to create a safe and fun soap box car, and last, have fun and make new friends.” Not only did Marcus accomplish all these goals, but he finished 6th in his division in the All American race, making the Telford Borough Police Department and entire community very proud. Not only did Sgt. Minninger and his colleagues want to take full advantage of the race as an opportunity for their officers to deepen their positive relationships with local youth and their families, but they also wanted to raise funds in support of the National Law Enforcement Officers Memorial Fund, and they did just that. 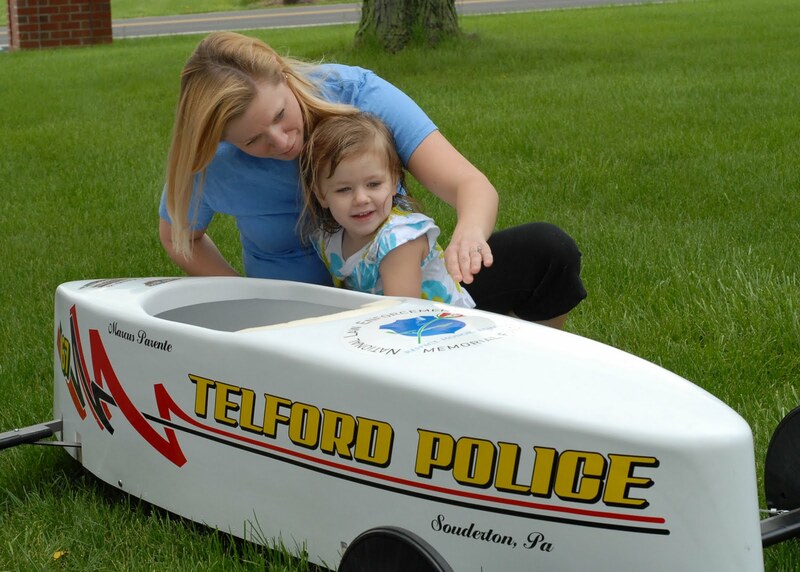 With the help of the community and by affixing the Fund’s Rose & Shield logo to the soap box car, the Telford Borough Police Department raised awareness and $1,000 for the Memorial Fund. Team SAC PD Completes "Race Across America"
Last week, officers from the Sacramento (CA) Police Department presented Craig W. Floyd, Chairman & CEO of the National Law Enforcement Officers Memorial Fund with a directory containing the names of 19,298 officers killed in the line of duty after completing a grueling and physically challenging cross country bike ride. Team SAC PD began their journey in Oceanside, CA and arrived safely in Annapolis, MD after completing the "Race Across America." Each team member rode with a thumb drive also containing the name of all known officers killed in the line of duty. For more information on how to get involved with Team SAC PD, contact Lt. Jim Beezley at jrbeezley@pd.cityofsacramento.org. Photos from their journey are available on Facebook. Major League Baseball manager of the Cleveland Indians, Manny Acta, received the National Law Enforcement Officers Memorial Fund’s first-ever Chairman's Award on May 19, 2011. The award was presented at the Chicago White Sox vs. Cleveland Indians baseball game at Chicago’s U.S. Cellular Field during the Chicago White Sox's Law Enforcement Day at the Park, to honor local Chicago law enforcement personnel, including the five Chicago officers who made the ultimate sacrifice last year. A deserving recipient of this inaugural honor, Manny is a fervent supporter of the Memorial Fund and the upcoming National Law Enforcement Museum, currently under construction, as well as an advocate for the law enforcement profession and the brave men and women who serve and protect our communities. In 2009, Manny filmed a public service announcement for the National Law Enforcement Museum that aired at Nationals Park—home of the Washington Nationals, where he served as manager for three years before moving to Cleveland. The National Law Enforcement Officers Memorial Fund “Chairman’s Award” is presented to a deserving individual or organization that has assisted the Memorial Fund in its work to honor the service and sacrifice of America’s law enforcement officers, and/or has made contributions to the law enforcement profession. 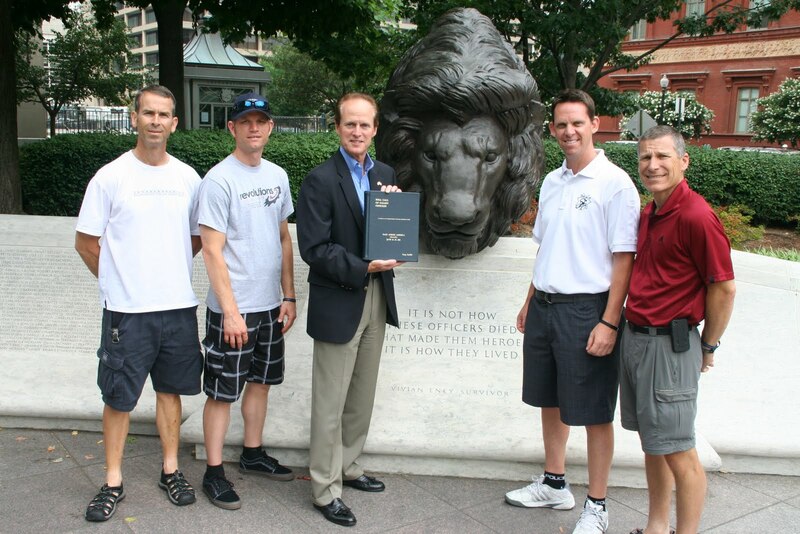 The award was given to Manny by Memorial Fund Chairman and CEO Craig W. Floyd, Director of Development & Law Enforcement Relations John Shanks, International Association of Chiefs of Police Executive Director and Memorial Fund Board Member Dan Rosenblatt, Deputy Executive Director Jim McMahon, and Research Center Director John Firman, along with Gates (NY) Police Department Detective and Memorial Fund Ambassador Joshua Bowman, right on the baseball diamond at U.S. Cellular Field. “The Memorial Fund is extremely grateful to Manny for his dedication to law enforcement and our worthy cause. We hope that his support and leadership will encourage Major League Baseball and other professional sports to honor law enforcement and participate in the Museum campaign, appropriately called “A Matter of Honor,” said Mr. Floyd. For more information about the Museum campaign and how to donate visit: www.LawEnforcementMuseum.org.